With this setting, the element will only be shown when the filter is active. you can also specify whether a text item should be displayed, when the element is initially hidden. Click here for more information about defining this text. The dependencies already defined on this page will be listed here. Dependencies in this list are active for the controls defined within them. Entries can be moved from one list to the other with the horizontal arrow buttons. Opens a dialog where a new dependency can be defined. The currently selected dependencies will be deleted and is therefore no longer available to other controls. 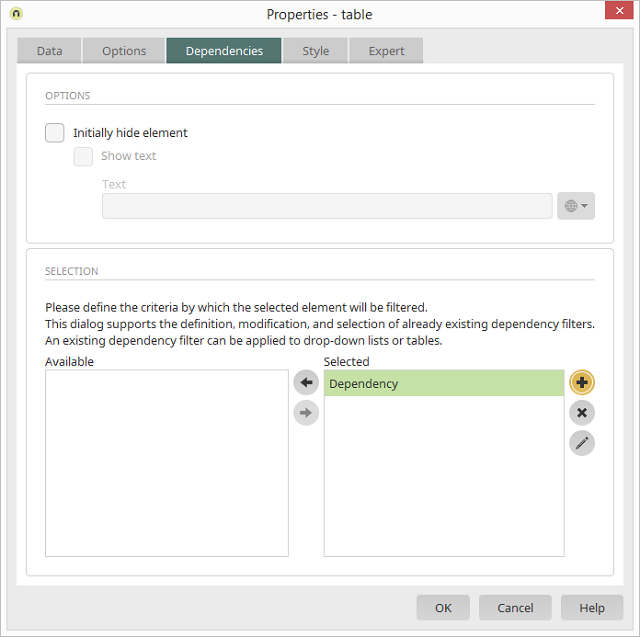 Opens a dialog where the properties of the selected dependency can be modified.